We re-analyze the flavor decomposition of the pion-nucleon σ-term in the framework of baryon chiral perturbation to fourth order. We employ a covariant and the heavy baryon framework including also the low-lying decuplet. Using only continuum data, we find a small strangeness content of the proton. The uncertainties are, however, large and might be overcome by dedicated lattice QCD calculations. A. Bottino, F. Donato, N. Fornengo and S. Scopel, Implications for relic neutralinos of the theoretical uncertainties in the neutralino nucleon cross-section, Astropart. Phys. 13 (2000) 215 [hep-ph/9909228] [INSPIRE]. J.F. Donoghue, E. Golowich and B.R. Holstein, Dynamics of the Standard Model, Camb. Monogr. Part. Phys. Nucl. Phys. Cosmol. 2 (1992) 1 [Camb. Monogr. Part. Phys. Nucl. Phys. Cosmol. 35 (2014) 1] [INSPIRE]. B. Borasoy and U.-G. Meißner, Chiral expansion of baryon masses and σ-terms, Annals Phys. 254 (1997) 192 [hep-ph/9607432] [INSPIRE]. M. Frink and U.-G. Meißner, On the chiral effective meson-baryon Lagrangian at third order, Eur. Phys. J. A 29 (2006) 255 [hep-ph/0609256] [INSPIRE]. J.A. Oller, M. Verbeni and J. Prades, Meson-baryon effective chiral lagrangians to O(q 3), JHEP 09 (2006) 079 [hep-ph/0608204] [INSPIRE]. V. Bernard, N. Kaiser and U.-G. Meißner, Chiral dynamics in nucleons and nuclei, Int. J. Mod. Phys. E 4 (1995) 193 [hep-ph/9501384] [INSPIRE]. T. Fuchs, J. Gegelia, G. Japaridze and S. Scherer, Renormalization of relativistic baryon chiral perturbation theory and power counting, Phys. Rev. D 68 (2003) 056005 [hep-ph/0302117] [INSPIRE]. 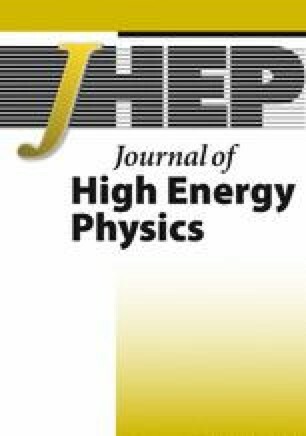 V. Bernard, N. Kaiser and U.-G. Meißner, Critical analysis of baryon masses and σ terms in heavy baryon chiral perturbation theory, Z. Phys. C 60 (1993) 111 [hep-ph/9303311] [INSPIRE]. V. Bernard, N. Kaiser and U.-G. Meißner, Aspects of chiral pion-nucleon physics, Nucl. Phys. A 615 (1997) 483 [hep-ph/9611253] [INSPIRE]. H.-B. Tang and P.J. Ellis, Redundance of Δ-isobar parameters in effective field theories, Phys. Lett. B 387 (1996) 9 [hep-ph/9606432] [INSPIRE]. N. Wies, J. Gegelia and S. Scherer, Consistency of the πΔ interaction in chiral perturbation theory, Phys. Rev. D 73 (2006) 094012 [hep-ph/0602073] [INSPIRE]. T.R. Hemmert, B.R. Holstein and J. Kambor, Chiral Lagrangians and Δ(1232) interactions: formalism, J. Phys. G 24 (1998) 1831 [hep-ph/9712496] [INSPIRE]. R.D. Young, D.B. Leinweber and A.W. Thomas, Convergence of chiral effective field theory, Prog. Part. Nucl. Phys. 50 (2003) 399 [hep-lat/0212031] [INSPIRE]. V. Bernard, T.R. Hemmert and U.-G. Meißner, Cutoff schemes in chiral perturbation theory and the quark mass expansion of the nucleon mass, Nucl. Phys. A 732 (2004) 149 [hep-ph/0307115] [INSPIRE]. M. Procura, T.R. Hemmert and W. Weise, Nucleon mass, σ term and lattice QCD, Phys. Rev. D 69 (2004) 034505 [hep-lat/0309020] [INSPIRE]. S.R. Beane, In search of the chiral regime, Nucl. Phys. B 695 (2004) 192 [hep-lat/0403030] [INSPIRE]. M. Frink, U.-G. Meißner and I. Scheller, Baryon masses, chiral extrapolations and all that, Eur. Phys. J. A 24 (2005) 395 [hep-lat/0501024] [INSPIRE]. M. Frink and U.-G. Meißner, Chiral extrapolations of baryon masses for unquenched three flavor lattice simulations, JHEP 07 (2004) 028 [hep-lat/0404018] [INSPIRE]. J.A. Oller, On the strangeness −1 S-wave meson-baryon scattering, Eur. Phys. J. A 28 (2006) 63 [hep-ph/0603134] [INSPIRE]. B.C. Lehnhart, J. Gegelia and S. Scherer, Baryon masses and nucleon sigma terms in manifestly Lorentz-invariant baryon chiral perturbation theory, J. Phys. G 31 (2005) 89 [hep-ph/0412092] [INSPIRE]. LENPIC collaboration, Few-nucleon systems with state-of-the-art chiral nucleon-nucleon forces, Phys. Rev. C 93 (2016) 044002 [arXiv:1505.07218] [INSPIRE]. M.R. Schindler and D.R. Phillips, Bayesian methods for parameter estimation in effective field theories, Annals Phys. 324 (2009) 682 [Erratum ibid. 324 (2009) 2051] [arXiv:0808.3643] [INSPIRE].